home > episodes > You Wanna Pizza Me? Click on the links below for the recipes! Pizza for breakfast?! Why not? This thing features a fat-free egg crust! This is like an oddly shaped pizza with chicken for crust. It's a face-ful of YUM. Frozen Pizza - Look for single-serving pizzas (you get to eat the whole thing! ), and be sure to check the serving size of those multi-serving pies. A fair amount of fiber is also advised (at least 4 grams per serving)! 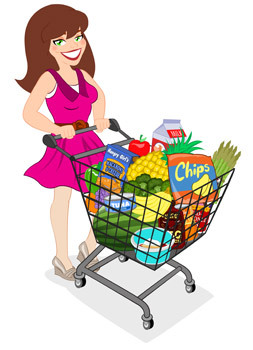 Here are some of my favorites: Kashi All Natural Thin Crust Frozen Pizzas, Amy's Pizzas and Pizza Snacks, Lean Cuisine Casual Cuisine Pizzas, and Weight Watchers Smart Ones Artisan Creations. 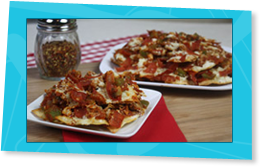 Unconventional Crusts - Try out sassy pizza bottoms like high-fiber tortillas (click here for the 411 on an HG favorite, from La Tortilla Factory! ), light English muffins (high in fiber with about 100 calories each), and even certain veggies, like bell peppers (sliced and baked), eggplant (sliced and grilled), and portabella mushroom caps (click here for a great recipe)! Cheeses & Toppings - Light string cheese is perfect for pizza -- just halve a stick and toss it in the blender (or just pull it apart) for EZ grated cheese with built-in portion control! For lots of flavor without a lot of fat, use reduced-fat Parmesan-style grated topping. And last but not least, turkey pepperoni is a must! Way less fat than the standard stuff and SO delicious. Hormel makes the best kind, hands down! 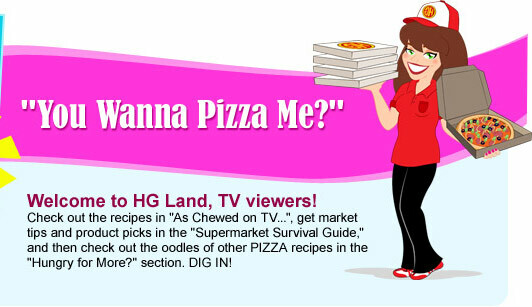 Check out all these pizza recipes, people!!! Pizza-Pied Nachos - One of the very latest cheesy, saucy creations to emerge from the HG HQ. Just chew it! Supremely Stuffed Pizza-fied Eggplant - Eat a HUGE serving of this fully-loaded, pizza-esque eggplant for only 170 calories. Woohoo! Loaded 'n Oated Spinach & Mushroom Girlfredo Pizza - Alfredo sauce, veggies, and a slightly sweet crust? Score! Purple Pizza Eaters - The weirdest little pizzas you'll ever chew... They're PURPLE! Best BBQ Chicken Pizza - The name says it all. This swap for the CPK classic has a tiny fraction of the fat and calories in the original! Pizza! Pizza! Egg Mug - A pizza-fied scramble made in the microwave?! Yup. Went there. Breakfast Scramble Pizza Pie - Because I couldn't give you just one pizza-for-breakfast option! The Great Greek Pizza - Open up and say opa!